In this post and video, we are going to share with you a 4-step blueprint you can use to make the right decision when choosing your HSC subjects for Year 11 and 12! Here’s your step-by-step guide to choosing your HSC subjects for Year 11 and 12! But first – download your FREE 4-Step Checklist for choosing your HSC Subjects for Year 11 and 12! The first step in choosing your HSC subjects is to start with subjects you’re passionate about! You will need to spend ALOT of time studying your subjects during Year 11 and 12. You will be spending 120 hours in Year 11, and 120 hours in Year 12 studying the subject during class. AND this doesn’t include the time you will need to spend studying for assessments and exams, and working on your ‘Depth Study’. Therefore, it’s very important you pick HSC subjects you are interested in, because you need to spend a lot of time studying them, and if you’re not interested in them, you simply won’t put in the work and effort. And if you don’t put in the work and effort, you won’t achieve good results. Of course, picking HSC subjects you enjoy also isn’t a guarantee that you’ll automatically get great results. But you have a much higher probability of scoring better results in HSC subjects you love and are willing to put in the work, than subjects you don’t enjoy and as a result are procrastinating from doing work on! Additionally, what can often happen is that when you pick a subject you aren’t passionate about, and you get stuck doing 400+ hours of work for it, it can kill your motivation for ALL your HSC subjects! So it can have dangerous consequences on your other subjects as well! Should I take a subject I really love, even if it doesn’t scale well? Or should I do a subject that scales well, even though I don’t enjoy it? Based on the above, our suggestion is that you should take HSC subjects you LOVE over subjects that simply scale well. Of course, the ideal world is picking subjects you love that ALSO scale well. But this doesn’t always happen. As an example, I really loved Geography and chose to take it during the HSC, even though it didn’t scale very well. I knew that because I loved Geography, I would be motivated during Year 11 and 12 to put the work in to do well, and as a result, I’d be able to score very well in the subject, and the scaling wouldn’t have a big impact for me. And this is exactly what happened! I scored a high Band 6 in Geography for my HSC and still scored a 99.6 ATAR! Write a list of all HSC subjects you love and are passionate about! Once you’ve done this, you’re ready to jump into the next step! When you’re picking your HSC subjects, you need to think about what you might like to study at university! This is because university courses have ‘Assumed Knowledge’ and ‘Recommended Knowledge’ requirements to study specific courses. If you don’t study these subjects in Year 11 and 12, it makes studying these degrees at university very difficult (and in some cases impossible). Let’s look at some examples! If we haven’t covered your degree below, you can search for it here. To study Medicine: it is recommended students take Chemistry in Year 11 and 12. This is recommended (and not assumed), so this means that even if you don’t take Chemistry in Year 11 and 12, you can still study Medicine, although it will make your first year of study easier if you have taken Chemistry in Year 11 and 12! What if you don’t take Mathematics and instead do General Maths? You can take a ‘Bridging Course’ prior to starting university to prepare you, however a note of warning…These are like a firehouse to the brain. You learn ALOT of content very quickly, and often the foundations you build aren’t as strong as studying the subject for 2 years across Year 11 and 12. So, while you can take General Maths in Year 11 and 12, and then do a bridging course, university will be more challenging for you! Macquarie University recommends it. This means that while you don’t have to take it in Year 11 and 12, you should expect to be exposed to Mathematics of Advanced level in the degree. So to best prepare yourself for the degree, it’s recommended you studying Mathematics (Advanced) in Year 11 and 12! Note, Sydney University listed ‘Mathematics’ as ‘Assumed Knowledge’ for Psychology and requires students to score a minimum Band 4 to be eligible. To become a Vet: there are a lot of Assumed Knowledge and prerequisites!!! You will need to take Chemistry, Mathematics (and score 70%+) and Physics. This is a common course that many students want to study, but are unaware of the ‘Assumed Knowledge’ component. So if you’re thinking about Vet, make sure you pick these subjects! Physiotherapy: requires Physics and Chemistry as assumed knowledge, which surprises many aspiring Physio’s who mistakenly believe that Biology would be a prerequisite! Additionally, Mathematics (Advanced) is also recommended! For Engineering: you need to take 3U Maths and Physics. Additionally, it’s recommended students take another Science (either Biology or Chemistry), and to provide a very strong Mathematical foundation for university, Extension 2 (4U) Maths. 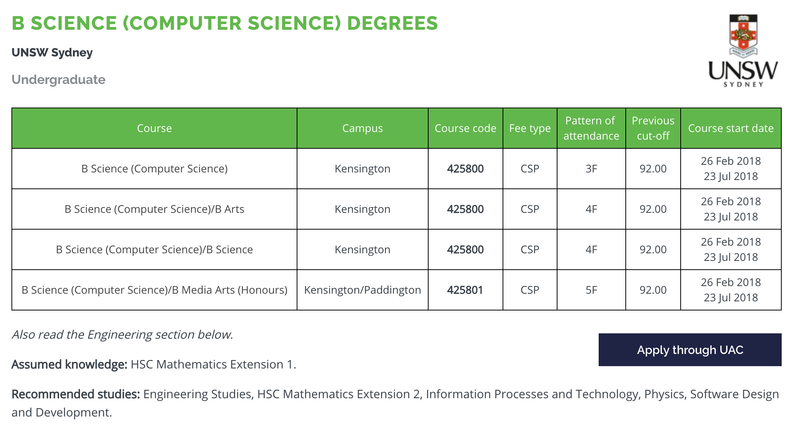 Computer Science degrees: require students to take HSC Extension 1 (3U) Mathematics. While all the programming skills will be taught at university, students can set themselves up better for university by also taking Physics, Information Processes & Technology, and/or Software Design and Development! Science: there are a number of prerequisites for Science, including Chemistry and Mathematics (Advanced) at a minimum, plus an additional Science, or Maths! So to study Science at university, you will need to study either 2 Sciences and 1 Maths, or 1 Science, and 2 Maths subjects. Note, Sydney University also requires minimum 70% score in Mathematics! Commerce requires a minimum of Mathematics and recommended Extension 1 (3U) Mathematics. While you can study the course with taking Standard Maths in Year 11 and 12, it makes university ALOT harder given that in your first year of a Commerce degree, you will have a number of ‘Core’ compulsory subjects that rely on Mathematics! Actuarial Studies: if you’re thinking about Actuarial Studies, make sure you’re taking at a MINIMUM, Extension 1 (3U) Maths! Ideally, you want to take 4U Maths so you can be confident of excelling at university! Law: The good news with Law degrees is that there are no assumed knowledge requirements! In saying this, from studying a Law degree myself, the stronger your level of English writing ability, the better you will go! So we’d recommend studying a minimum of Advanced English to best prepare you for a Law degree! Aviation: Thinking about going into Aviation as a pilot? Make sure you take Advanced Mathematics, and ideally Physics as well! What if you don’t know what you want to do at university yet? How should you then factor all of this in? If you don’t know at this stage, that’s okay! But it’s important to think about what options you want to create for yourself once you’ve finished the HSC. As a result, think about what options you might want to have for yourself when you finish Year 12, and then pick the subjects that will give you these options. For example, if you think you might want to study Engineering, pick Extension 1 Maths, and Physics. Get an idea of what universities you might like to attend, what degrees you’re interested in and if they have any pre-requisite or recommended HSC subjects. You don’t have to decide on a university or particular degree right now, but it’s important to get an idea of what to expect when you do decide. This step is important because you don’t want to take on more work than you can handle! The main thing to think about here is major works. Generally, we recommend that you stick to 2 major works at most! They’re called major works for a reason, and taking more than two at the same time can be really full on. For more tips about HSC Major Works, check out our article on Major Tips for Major Works! You don’t know what you’re capable of taking on yet! You’re likely in Year 10 now, and you will grow so much over the next 2 years that you don’t really know what your capacity for the workload is going to be like! Additionally, you can also drop down from a subject, but you can’t move up. For example, you can drop down from Extension 1 Maths to Advanced Maths only. But you CANNOT move up from Advanced Maths to 3U Maths later on if you decide you would like to have a go at it. So as result, we recommend challenging yourself first and not worrying too much about workload. Go for the more challenging subjects initially, and then if the workload proves to be too difficult, you can drop down. You are capped anyway in taking 12-13 units depending on timetabling at your school, so this will also limit the workload being excessive! Don’t limit yourself too soon by picking HSC subjects you think will be easy! The reality is that all HSC subjects will take work. However, we do recommend not taking more than 2 major works! Challenge yourself! You don’t know what you’re going to be capable of in Year 11 and 12 just yet! You shouldn’t be picking your HSC subjects based on scaling alone! In fact, as we discussed in Step 1, choosing HSC subjects you are passionate about it much more important than subjects that simply ‘scale’ well. However, it is important to take scaling into consideration, especially when choosing what level of English and Maths you’re going to take. You could be in the bottom 25% for English Advanced, and that mark, when it’s scaled to calculate your ATAR, will be as high as the scaled mark you would get in the top 25% for English Standard. In other words, the bottom 25% scaled mark in English Advanced = the top 25% scaled mark in English Standard! Below is an extract from Page 44 from University Admission’s Centre Report on Scaling. It shows that ‘Scaled’ Mark that students receive if they are specific ‘percentiles’. To understand the impact of scaling, we want to look at the last column which provides the scaled mark (out of 50) for students performing in the bottom 25%. This means that it actually doesn’t make much sense to take Standard English, UNLESS you KNOW if you take Standard English you will be in the top 10% of students. The other reason why you should always go for the high-level subject rather than the lower level, is because you can’t go up but you can drop down! So you can always start with Advanced English, and then drop down to Standard English later! Start with the higher level subject, and if you find it’s too difficult then you can drop down later! But, what about scaling for HSC Mathematics? The scaling implications for Maths aren’t as extreme. Typically, if you’re in the bottom 25% for Mathematics, it’s similar to being in the top 40% for Standard/General Maths. What we can see here is scoring in the P25 for Mathematics gives you a scaled mark of 24.8. This is roughly equivalent to being in the P60 in General/Standard Mathematics. But, note, if you are in the P50 in Mathematics, you would score a 32.4. If you know you can drop down to Standard Maths, and score in the Top 10%, your scaled mark will go to 36.4. So sometimes dropping down to General Maths can be advantageous for you from a scaling point of view. You could drop down to General Maths, but as we discussed in Step 2, this could have implications for university pre-requisites and recommended subjects and mean you will have to take a bridging course before going to uni. But, what about scaling for HSC Physics, Chemistry and Biology? We’ve included from the UAC Scaling report the scaled marks for Physics, Chemistry and Biology. As you can see, Chemistry and Physics are very similar with P25 scaling to 23.4 for Physics, and 24.9 for Chemistry, making Chemistry marginally better. Biology is quite a bit behind, at 18.3 (almost a 5 point difference…) Note, both Chemistry and Physics are also prerequisites for a number of university courses, also making them good options on this level! But remember Step 1 and pick subjects you will enjoy! If you think you will love Biology, take it! If you perform in P90 (Top 10%) in Biology you will score 40 scaled mark. If you take Chemistry (for example instead) which you don’t like as much because it scales better, you may find yourself in the Top 25%, sitting on a scaled mark of 39, which is worse than Biology. So, it can pay to take subjects you love, especially if you do well in them! You should go with English Advanced because even if you’re doing poorly and in the bottom 25%, your scaled mark is still going to be similar to or better than the top 25% of English Standard. If you’re trying to decide between General Maths or Mathematics, go for the higher level! Remember: you can always drop down later if you need to! But wait! Don’t forget to download your FREE 4-Step Checklist for choosing your HSC Subjects for Year 11 and 12! #1. Choose your HSC subjects based on what you are passionate about first: you will be studying these subjects for over 400 hours! If you don’t enjoy them, you won’t put in the work, and you won’t get good results anyway (regardless of scaling).Additionally it can make you unmotivated overall for all of your subjects! If you enjoy a subject you’ve got a higher probability of doing well at it! #2. Pick HSC subjects that prepare you for the prerequisites for your goal university courses: make sure you think about the courses you want to do at university. If you don’t take the correct subjects during Year 11 and 12, you might not be able to study the degree, or you will need to do a bridging course and it will make your university studies much more difficult! #3. Don’t worry about workload, except when it comes to major works: Don’t take more than 2 subjects with major works as this will be challenging. Otherwise, don’t worry about workload yet. You don’t know what you are capable of yet, and you can always drop down, but you can’t move up a subject level! #4. Factoring in scaling as your last step and think about it carefully for English and Maths: It makes the most sense to take Advanced English from a scaling point of view. Taking Standard Maths can be beneficial from a scaling point of view, but watch out for your universityprerequisities and whether you need to take Advanced Maths! Looking for a tutor to support you while you ace the HSC? We pride ourselves on our inspirational coaches and mentors! We offer tutoring and mentoring for Years K-12 in a large variety of subjects, with personalised lessons conducted one-on-one in your home or at our state of the art campus in Hornsby! Isabella Hanley loves science. She loves science so much she’s making it her career. While completing her Bachelor of Medical Science she is also a Coach and Digital Content Manager at Art of Smart. She is super passionate about sharing her knowledge on surviving the HSC since completing the HSC herself in 2014. In her downtime she enjoys Netflix binging like a pro, singing in the shower and hanging out with her awesome rescue dog, Ruby.